If you are a new leader in your church’s hospitality or welcome ministry, buy access to this online class to help you get started in preparing for the upcoming season of welcome. It feels like staring into the fog. Let me help you get the fog out and help develop an action plan to help you get unstuck. Sign up for Step up! 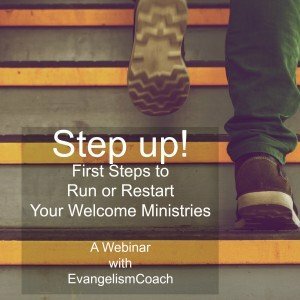 : First Steps to Running or Restarting Your Welcome Ministries, an online class with other leaders who are in a similar position. I’ve helped other hospitality ministry leaders breakthrough that log-jam of inaction and set them moving forward again. They felt like they were staring into the fog and not seeing much of anything clearly. As I have been the new mover looking for a new home church, I have fresh lessons to share. Price: Click to See the Pricing. Did you inherit a stale welcome ministry and need to re-launch it? Or perhaps you are rotating off your committee leadership soon and need to train your replacement. Access to the class on the night of the presentation. Click to see the pricing for the recorded version. You’ll receive a reminder emails with the access codes as time grows closer. You’ll receive your receipt by email which should contain the entrance link that will be unique to you. 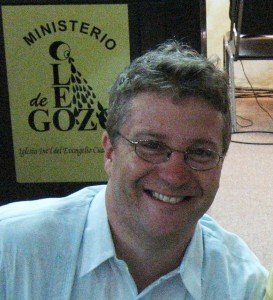 Chris has given Evangelism Training seminars around the US and 10 Countries in Latin America. He is fittingly known as the Evangelism Coach because of his extensive work with churches in the US and Latin America in the areas of evangelism and church growth. Chris is an ordained pastor in the Presbyterian Church (USA). Q. What if I’ve been leading the hospitality ministry for a few years? You may find that this class will spur some creativity or give you different angle to look at things. I won’t simply say “be nice to people” or “tell your greeters to say this phrase” but teach hospitality leaders how to identify shortcomings in their own context and think through ways to fix them. The get started steps will focus on helping provide a framework for action over the next six months or so. Questions before the live class? Sometimes, there are problems with bandwidth. If the audio is really awful, I will re-record the webinar in a studio and make the re-recording available for replay. I did that with the last church greeter training webinar. I want people who are motivated to learn and will apply what they learn. Free webinars are great when I am selling a product or service, where I can recoup the cost the webinar. Click the big button and you’ll be taken to EvangelismCoach Sore to process your payment and receive instant access to the recording. If I register on this tablet, do I have to use this tablet for the webinar? We will be using a smart TV at church. With internet will we be able to download information from my tablet or access your webinar without difficulty with the information you provide the night of the webinar. Thanks. As long as you have internet access, you’ll be able access from any device. You should already have the handout since it’s in the receipt. About 30 minutes before, I’ll be sending the join now link for people to start logging in. cannot access on our church tv due to Citrix, so using a laptop for five people, but audio is good and so is laptop screen. look forward to your info. I am very interested in “First steps to running Welcome Ministry”. I could not take due to schedule conflict. Was the session recorded? Are PowerPoint slides available also? I would be happy to pay for this. Thank you for your ministry. Your articles have been so valuable to me as a minister. I’m getting it ready for distribution in the store by Monday, if not sooner. Thank you Chris. I am so excited about learning about Welcome Ministry from your vast experience!